134 pages | 22 B/W Illus. Emma Goldman’s Supreme Court appeal occurred during a transitional point for First Amendment law, as justices began incorporating arguments related to free expression into decisions on espionage and sedition cases. This project analyzes the communications that led to her arrest—writings in Mother Earth, a mass-mailed manifesto, and speeches related to compulsory military service during World War I—as well as the ensuing legal proceedings and media coverage. 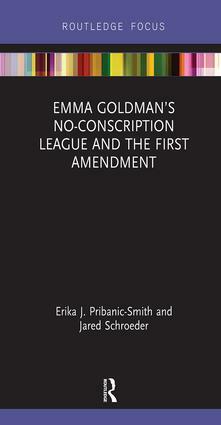 The authors place Goldman’s Supreme Court appeal in the context of the more famous Schenck and Abrams trials to demonstrate her place in First Amendment history while providing insight into wartime censorship and the attitude of the mainstream press toward radical speech. Erika J. Pribanic-Smith is an associate professor of journalism at the University of Texas at Arlington. She specializes in research examining political communication in newspapers and magazines of the nineteenth and early twentieth centuries. Specifically, she focuses on political partisanship in the press as well as the use of editorials and letters to the editor to disseminate political ideology. A former president of the American Journalism Historians Association, Pribanic-Smith has published her research in journals such as American Periodicals, American Journalism, Journalism History, Kansas History,and Media History Monographs. She also is the author of several book chapters. Jared Schroeder is an assistant professor of journalism at Southern Methodist University. His research focuses on how we should interpret the First Amendment, particularly in regard to the Supreme Court’s use of the marketplace of ideas theory and, importantly, as more and more discourse occurs in virtual spaces and artificially intelligent communicators are playing larger roles in influencing the ideas that citizens encounter, comment upon, and share online. He is the author of The Press Clause and Digital Technologies Fourth Wave (Routledge, 2018) as well as articles in journals such as Communication Law & Policy, The Review of Higher Education, First Amendment Studies, and the Journal of Media Law & Ethics.